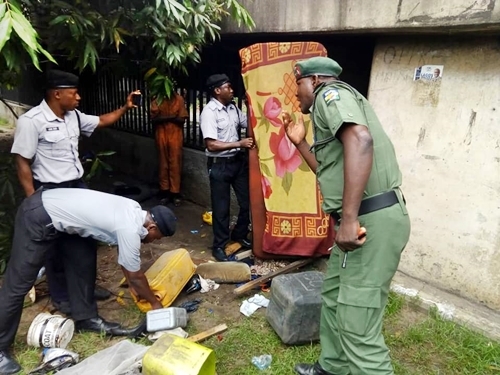 A den suspected to be used by ritualists and criminals located around Onikan Stadium, descending to Army flag House, close to the Governors House, Marina, Lagos Island, has been uncovered and dislodged by officials of the Lagos State Central Business Districts enforcement unit. While speaking to journalists, the Special Adviser to the Lagos State Governor on Central Business Districts, Olarenwaju Elegushi said the hideout was similar to previous criminal and ritualist hideouts discovered in various parts of the state some months ago by security operatives. He said it was uncovered while carrying out Governor's directives to clear the area of debris and refuse which had accumulated under the bridge and its environs. He added that no arrest was made but different items like: charms and dangerous weapons were discovered and cleared from the place adding that police authority and armed forces settlement close to the area had been notified of the discovery for necessary action. He said: “We received the Governors directives to clear the area of refuse and debris which had accumulated overtime and in the course of carrying out the directives, we uncovered the place which has been under surveillance for long. Mr. Elegushi vowed that the office would leave no stone un-turned to dislodge criminal hideouts on the Island and make the Lagos Island business district safe for business transactions and leisure.